Today I’m joined by Meri Cherry (yes, that’s her real name!). 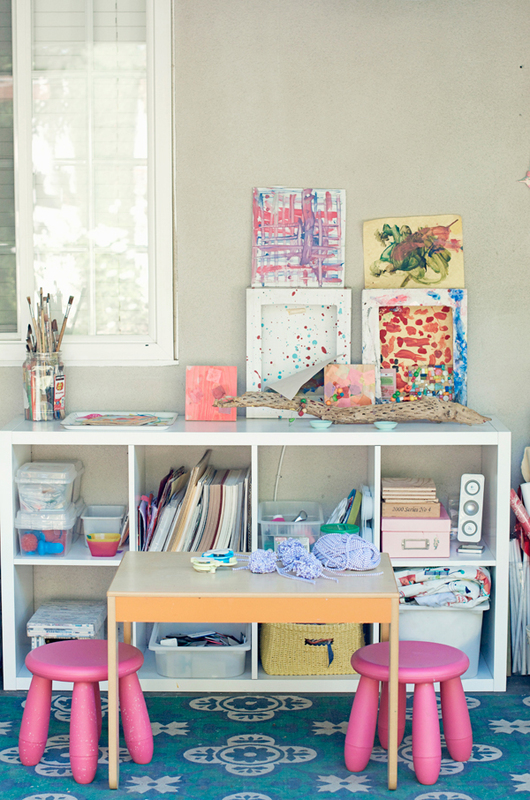 Meri is a mom of two little artists in sunny Los Angeles. 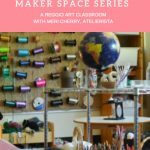 She’s also an atelierista at Kol Tikvah Early Childhood Education Center, and you may remember that Meri recently paid TinkerLab a visit when she shared a peek into her school’s Tinkering Space. Oh my goodness, that interview was INSPIRING! 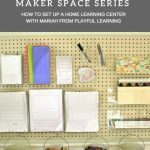 Today Meri is here to give us a bit of New Year’s inspiration for designing the home tinkering space. 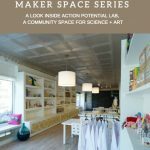 This interview is part of Tinkering Spaces, an informative series of interviews that center on designing kid-friendly creativity spaces. If you’re scratching your head because you can’t figure out where to put your children’s art materials, hatching a plan to turn your laundry room into an art room, or shifting furniture to make room for a new easel, these interviews are sure to give you food for thought. Welcome back, Meri! As you know, I’ve been a fan of your inspiring website and blog, Meri Cherry, and I’m also thrilled to be one of the newest members of your art group, Rockin’ Art Moms. 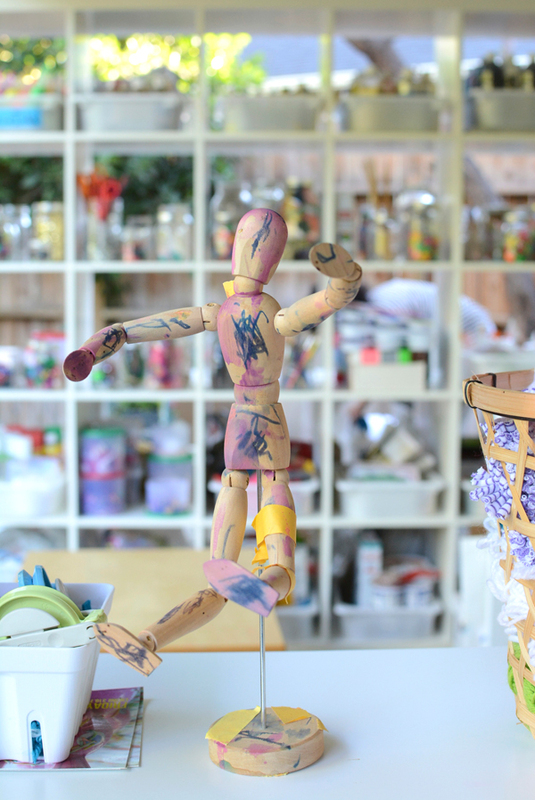 A few of the the things that stand out about your work are the cheerful colors that you infuse your space with, the intriguing materials that you offer children, and how willing you are to encourage messy, whole-body art with little makers. I’m so glad that you’re here to share your newest adventure with us today! RACHELLE: Can you tell us about your family? MERI: Sure! Usually only the therapist asks that question. This is way more fun! 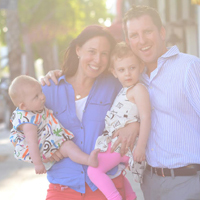 It’s me, my husband Evan, and our girls Gigi and Diana “D.” We are lucky enough to live in Los Angeles, California, where the sun is almost always shining and art is pretty much happening on the daily. I may not cook, but I can definitely craft. RACHELLE: I love this photo of you painting away in your backyard. The spaces are so inspiring (and that SHED)! Can you describe it for us? MERI: Our backyard space is constantly evolving. It’s most recent phase is really exciting. It consists of two parts. 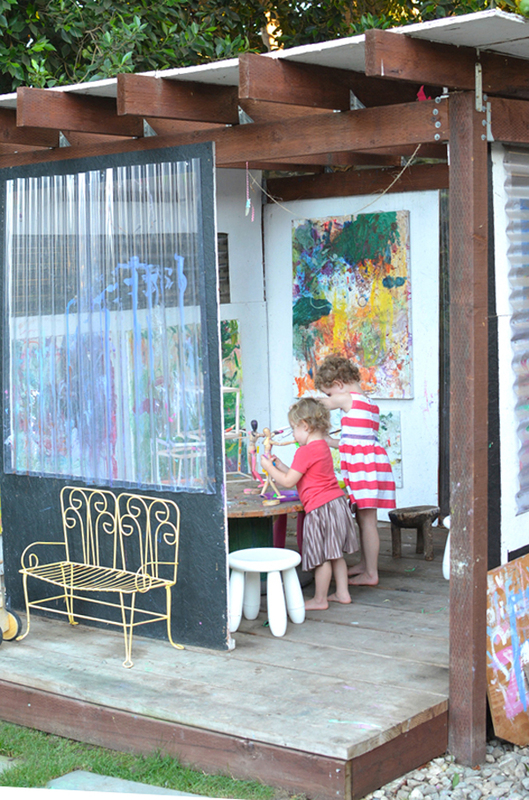 First, there is the studio area, which lives under an overhang up against our house and the second is the art playhouse that is nestled in a corner of the backyard. My husband and cousin built the playhouse, which still blows my mind. When I married my husband he never mentioned he was a super duper craftsman. Thank goodness I figured it out! We live in a pretty small home, so having the playhouse is like adding another room. 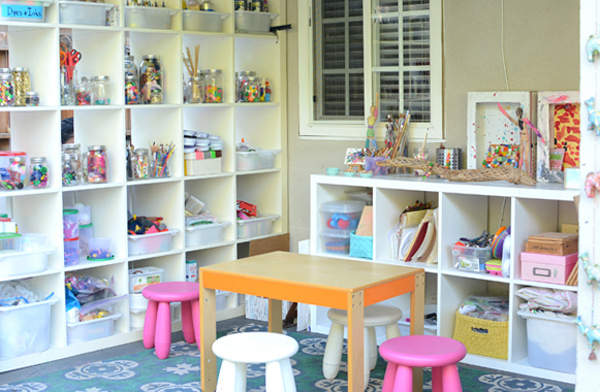 It’s a place the kids can go and be creative, independently and with friends. The art studio is a makeshift area from expedits purchased at Ikea. I have a somewhat insane collection of art supplies. Prior to this space they were jammed in the shed and inside the house. Now, to my husbands delight, they live outside. Well, most of them do : ) Both areas are kid friendly. I keep safe things down low so the kids have access to what they need. It’s a space I continue to love and appreciate everyday. RACHELLE: If you had to be selective, what three things do you love most about your space? MERI: I love that everything has it’s space. Different kinds of paints are in different bins, sewing supplies are in a container, odds and ends for tinkering are in jars. Before I had to mine through huge plastic bins trying to find googley eyes or pom poms or something and now they are right there on the shelf, ready to go. That’s definitely one thing I love. I also love that it’s a space that is always open. I don’t have to set anything up per se. My girls can just go outside and be creative. That’s a nice relief when they are looking for something to do. The third thing I love about the space is that it’s beautiful! Seeing all the supplies lined up perfectly (on a good day) is inspiring. I love looking at art supplies. It just makes me feel happy. I think the space overall is a really happy space and I like that. RACHELLE: Do you have any tips for those of us who want to make our homes havens for making? MERI: Yes. Baby steps. I didn’t just wake up and have all these supplies or this set up. 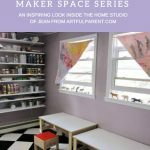 An art studio or art space is a work in progress and you don’t have to transform a whole room or backyard. You can start with a cart. If you are looking for something more substantial than a cart, maybe try a little desk or wall. Putting up some shelves on a wall is a great way to start a tinkering space. You can put out some collections in a tinker tray or just some papers, scissors and drawing supplies. A little goes a long way. If your family responds to it, you can build off that. Ikea is great and inexpensive spot for trying out different ideas. You can even transform a closet into a kid friendly making space. RACHELLE: What three supplies are indispensable to you and your children at this moment? MERI: Liquid watercolors with pipettes are big in our house. We use them a lot. We also love wood mannequins from ikea, similar to these (affiliate). We paint on them over and over actually. My girls have been working on theirs for months. They take them down whenever they are in the mood and it always makes me smile. We also love big canvases and have amassed quite a collection of what we call evolving canvases. We keep them out over long periods of time until we feel done with them. My girls paint them with rollers, brushes, stamps, etc. It’s a really fun play date activity too. RACHELLE: As a parent to two young children, do you have any tips on how to engage toddlers and older children in art projects at the same time? MERI: Yes. I like to keep art as process oriented as possible. In other words, i make it about the experience, rather than the finished product. Activities like collage making, evolving canvases, open ended painting and working with clay, allow the chance for everyone to be successful. There is no determined outcome and therefore it’s win win for everyone. I share tons of process art ideas on my website. 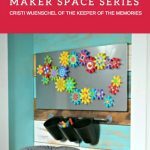 Some of my favorites are Tie Dye Paper Towel Art, Crayon Art Sculptures, and Robots from Tinker Trays. Another idea is to sit down and create with them. When you are engaged, your children are more likely to be engaged too. I know we all have a million things we’d like to be doing while our kids play, but sometimes it’s really nice to sit down and tinker with them. 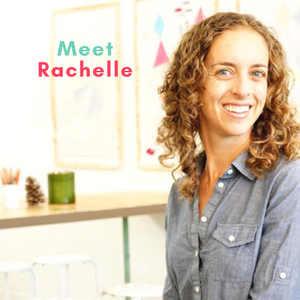 RACHELLE: I’m inspired by the art playgroups that you host. How do you structure these? 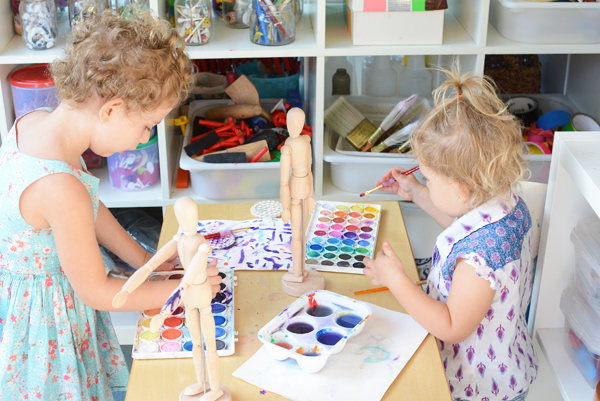 MERI: Art Playgroups started as a way for my girls to engage with our little ones in an artful way. We were doing so many fun things at home. I thought other moms would like to join in with their kids. I invited some friends over one Saturday and everyone had the best time. 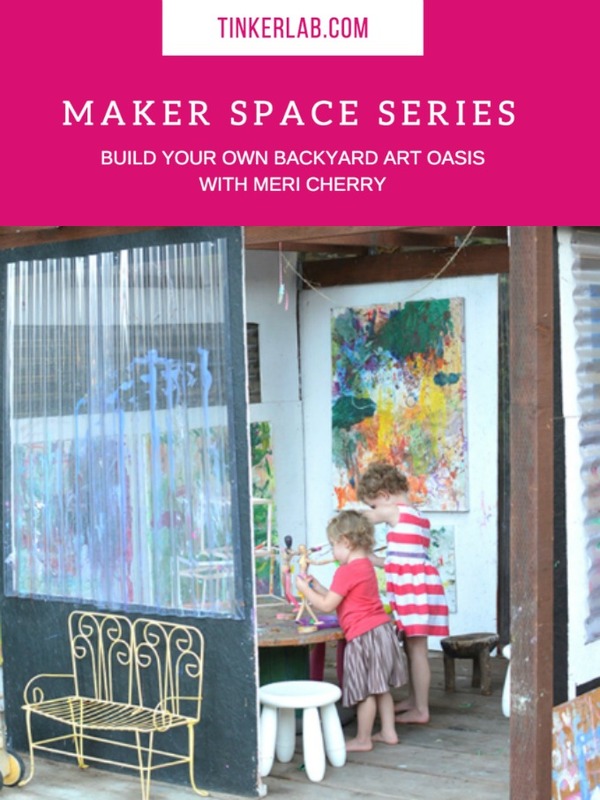 One friend told another friend, who told another friend and Meri Cherry Art Playgroups were born. I set up our backyard with all kinds of different sensory based activities for the kids to play with at their own pace. We would eat snack about halfway through and then I’d bring out some major sensory experience that everyone did together. 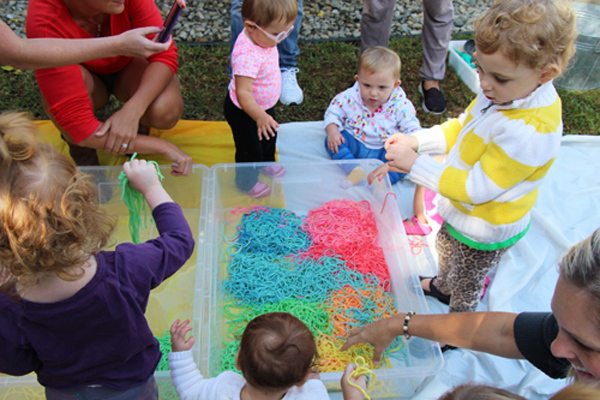 It was a great way to build community, make new friends, and expose kids to all kinds of wonderful sensory and messy fun. My girls loved it! We’ve slowed down a bit now that my girls are in pre-school, but you never know when we’ll do a pop up group. 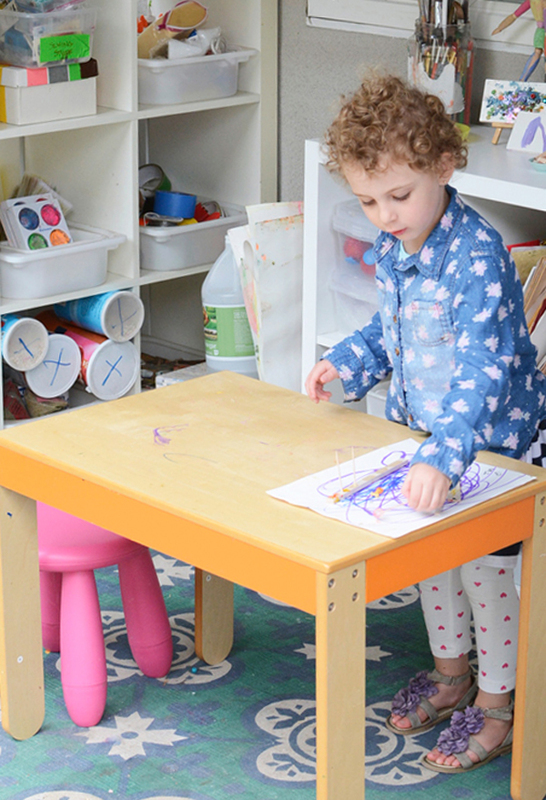 RACHELLE: Can you give three tips for parents who would like to set up their own art playgroup? MERI: I would say it’s similar to setting up your own art studio. Start small and take baby steps. 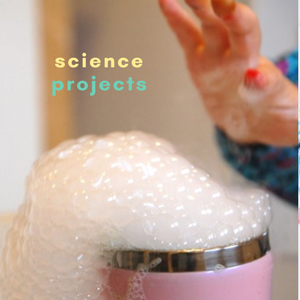 Maybe set up one great sensory activity, like rainbow ooblek, and invite a friend or two over. If you feel like it’s a manageable, fun experience and you want to do a little more, try inviting a few friends over and maybe set up two activities next time. 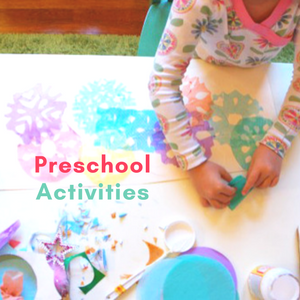 I have a ton of ideas on my website for art play group activities as well as a break down of how we did them. Just click the links. 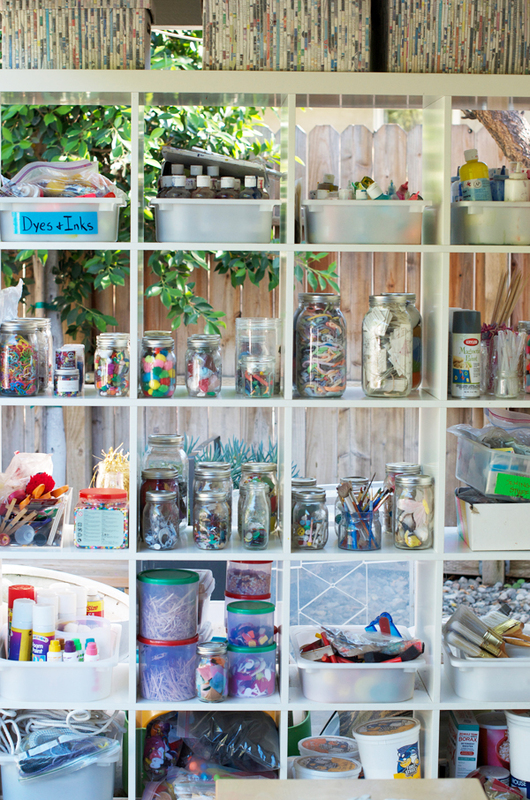 RACHELLE: Can you share a favorite tip for organizing your creative zone or for cleaning up after a creative session? MERI: For clean up I recommend tarps! Tarps were my best friend when I did playgroup. I bought tons of plastic table clothes from Target. I like the ones with the flannel on one side and plastic on the other. I also used plastic shower curtains from Ikea. I set them on the grass and put large shallow tubs on them for the activity. It worked really well. You can do this inside as well. For organizing I am all about jars. Jars, jars and more jars. I love em. I know some parents are like “WHAT?! Glass jars with kids? ?” The truth is I’ve used jars for years and I’ve had in total, two break. Mason jars are super sturdy and I train my kids best I can to be really careful with them. Also, I keep them up higher so they don’t really touch them without asking for my assistance. I find jars to be the perfect container for collections of things and small supplies. My number one rule for organizing art supplies is, if you can’t see it, you won’t use it. So, jars are totally perfect for seeing all that great colorful inspiration. 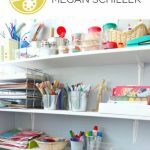 For more tips on organizing art supplies check out this post. RACHELLE: What do you wish for your children to remember about their childhood? MERI: I think above all else I want them to remember a feeling of happiness. I know they won’t remember these days very much, when they got to paint their bodies from head to toe, or sit in a mountain of rainbow spaghetti, but I hope they’ll remember a feeling and know they were loved. RACHELLE: It looks like your wish is coming true, Meri! Is there anything else you’d like to share? 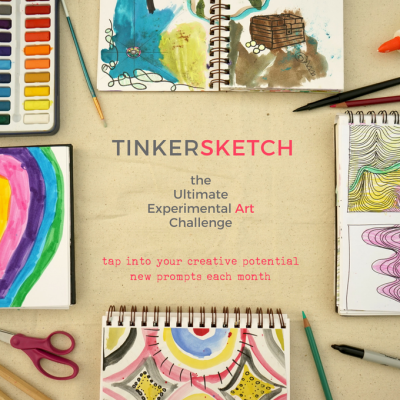 MERI: I’m so grateful to be able to share our family art space here on Tinkerlab. Thank you Rachelle! I truly believe in art as a primary resource for raising healthy, happy, creative thinkers and problem solvers. I feel really blessed to have this space and to be able to share it with all of your readers. Thank you Tinkerlab! 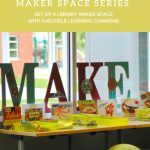 RACHELLE: And thank YOU for sharing your inspiring space with us. I know that a lot of families are taking notes! 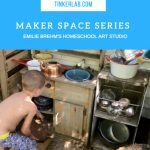 Tinkering Spaces | Turn a porch into a Family Art Studio! I love your outdoor space! I’ve always dreamed of something like this. Yours is especially cool as it is open…kids will tend to use it more if a space isn’t so closed off. Isn’t that a great space, Patty? You make good point that easy access to materials makes us more willing and interested in using them. I’m always happy when my kids spend more time outdoors, and something like this would obviously help with that, too! Thanks for your comment. Hi, I live somewhere where there is much more rain and wind than LA! Any tips for crafting outside when the weather isn’t so good? Great question, Katherine. Looking at Meri’s space, it seems that having an overhang and some walls would help. In a thread on Instagram, she also shared that when it’s rainy or windy she’ll cover areas with tarps. I absolutely adore that outdoor space. We’ve recently moved and I’ve dedicated a space inside for my daughter’s creative pursuits… I’d love to add something like this one day too outdoors. Thanks for the ongoing inspiration ladies… this artsy mom appreciates it! That’s wonderful to hear, Crystal! Thanks for taking time to leave the lovely comment. 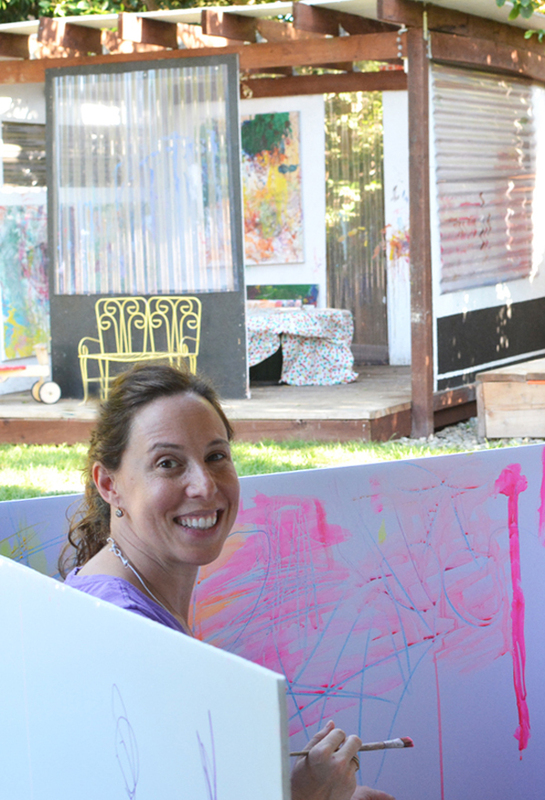 You are so lucky to live near Meri and share a piece of her creative oasis, Ana! She’s such an inspiration. I loved seeing the photos you shared of that outing, Bar! Meri’s space is so unique. I grew up in southern California and took pottery lessons in a friend’s backyard studio — it was amazing. If only we could all live and work outdoors like this. 🙂 But alas, at least most of us get a few months of good weather! Oh, I love everything about this right down to the lovely comments. Meri has a knack for spreading what I imagine to be, a rainbow of inner color through the way she sees the world, relates to it and makes it! Not only is this space light, warm, and colourful — you can see that it’s genuine, just like Meri. It’s so well and intuitively organised — it’s almost like one can reach into the photo, grab a brush and get painting! I’ve had the pleasure of sitting in one of those chairs on a pop-through visit from Sweden and YES: oh, she does amazing PR for LA living! Thank you for sharing this on your beautiful blog, as always! Gina, Thank you for the sweet comment. Meri is lucky to have a friend in you! I can’t wait to sit in Meri’s backyard and soak up some of that lemon-scented air. Have a wonderful day.